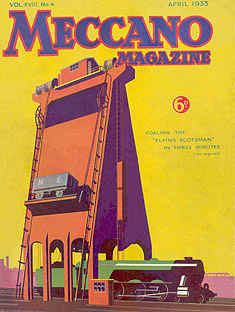 April 1933 Meccano Magazine stunning graphic of an LNER coaling stage. Models I have designed for the Vintage Special Edition Set. I often exhibit my models at the Museum of Power near Maldon full details are on their Website. December 01 MoP Christmas Fair. Box label from a 1911 No. 4 Outfit from my collection of old sets. A frequently built model from my childhood days. The heavy goods lorry built from the post war Number 5 set. A joy for many boys in the nineteen fifties like me was to receive at Christmas or Birthday an accessory set. To convert their set to the next one up in the range. The 4a box lid above is from 1954. 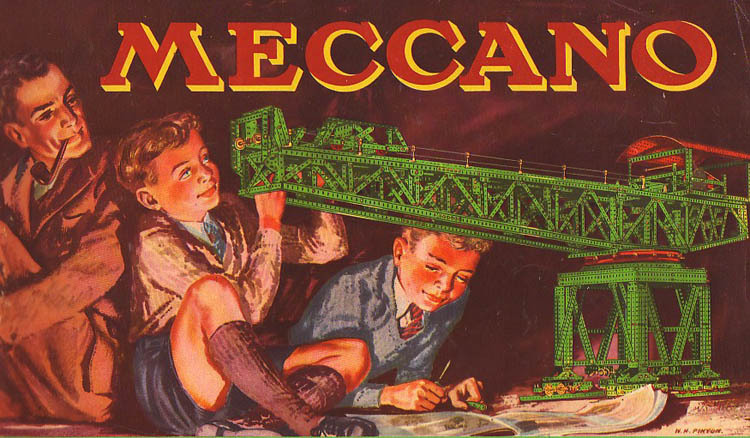 Meccano boys always looked keen and smartly dressed in the 1950's, note the tie and blazer. 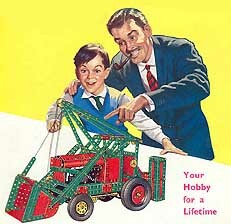 Picture is from the 1956 Meccano products catalogue. 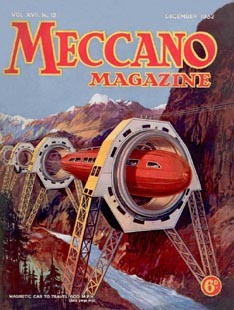 Meccano Magazine December 1932 magnetic transportation of the future. Big Red Racer, 1930s style racing car. 1920's Advertising block these could be supplied by the Meccano Company for local or national advertising. 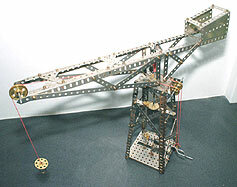 Girder crane from 1914 built with an original 1911 set. I am secretary of this friendly club based at Hainault in Essex on the Central Line. Visitors and new members are always welcome, click on the club logo for more information. Our next meeting is May 11 2019. If you have an interest in Meccano or would like to find out about "The world's finest" metal construction system this is place to be. I have been a "Meccano Boy" for most of my life but I have taken a more serious interest in Meccano as a hobby during past twenty years. 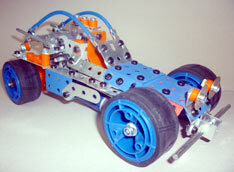 You can find out how I got involved with Meccano by following the link "My Meccano Life Story . "Featured above is my latest construction a 1940's American Station Wagon built with 1978/79 dark blue and yellow parts. There are over one hundred fifty pages, where you will find a mass of information about what can be built with Meccano, history and Meccano today. Contents also include some of the other products made by Meccano Ltd, such Aero Constructor, Dinky Builder, Hornby Dublo Railways and The Meccano Magazine. 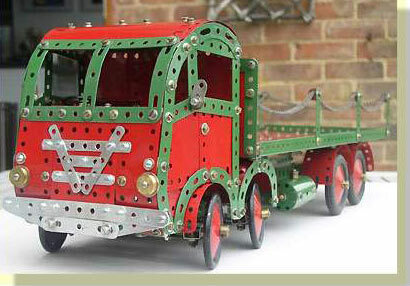 Find out how to restore old tatty parts and where to buy new and used Meccano. I hope my web site will be helpful in your Meccano model building and give ideas, inspiration or encouragement to get you, your children or grandchildren constructing Meccano models or perhaps a nostalgic visit for the days of your childhood. Scroll down this page and the left hand column to navigate my web site and click on the links . 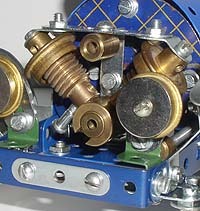 Your messages, questions and comments about Meccano are always welcome. I am pleased to give advice and help when ever I can. Do please note I do not give valuations for Meccano products nor do I sell Meccano or instruction manuals click here for information on where you can purchase these. The pages on this website are copyright of alansmeccano.org. feel free to download information and pictures for your personal use only. Please do not republish images in any form without first seeking permission from the site owner. Links to my site with credit are always welcome including Pintrest and other similar sites. New page 1940's American Station Wagon April 14 2019 New Aero Constuctor model . April 23 2019 Text changes. 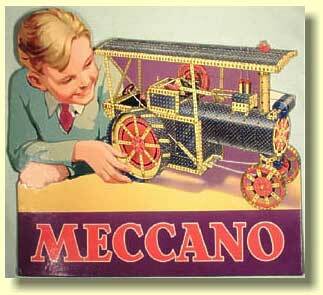 Meccano as a word is part of the English language but what exactly is it? 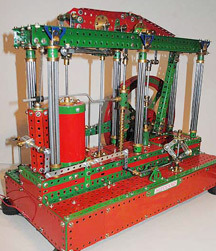 Traditionally Meccano is a metal, model construction system made up of strips as shown above, plates, brackets, girders, rods, wheels and gears, based on the principles of mechanical engineering. 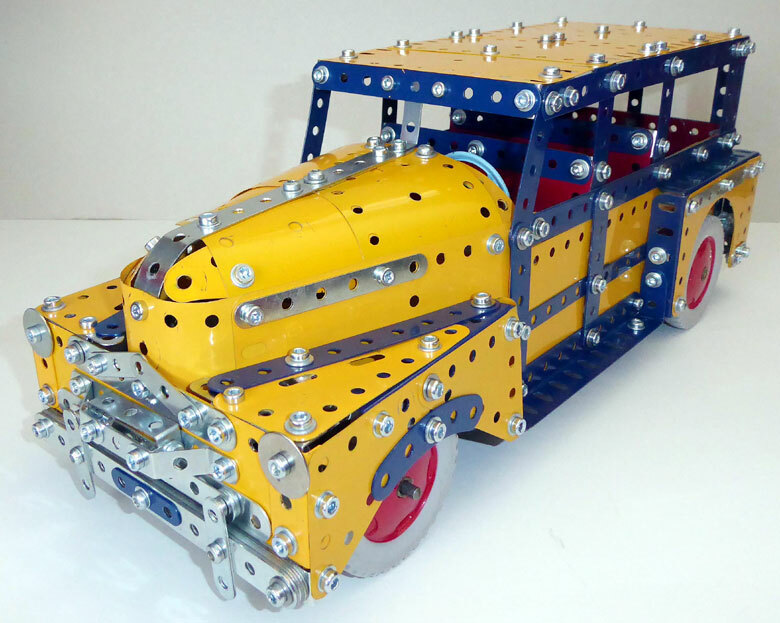 Meccano though is much more than just a toy or model building system it teaches how mechanical things are constructed and function. Below is a quote from Rashad of Victoria, Australia a visitor to Alan's Meccano Pages.
" I am one of the thousands who learned in the most wonderful way about worms and contrates and trunnions and flanges. Of how you used drive trains to maximise power. And all the other mechanical and physical knowledge that this amazing toy could impart." 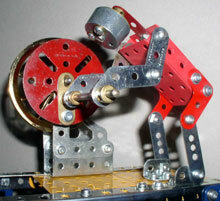 The Meccano system was invented 118 years ago by Frank Hornby, born May 15 1863 in Liverpool, England. 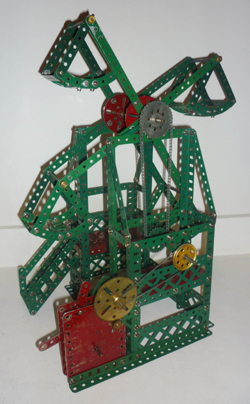 He had two sons and to help keep them amused he made them a construction toy consisting strips, wheels, rods and nuts & bolts that could be assembled to build simple toy trucks, cranes and other mechanical devices. These toys could then be then taken apart and made in to a different mechanical toy. Frank Hornby made these parts himself in his small home workshop probably his kitchen, where he cut strips from sheet copper and drilled holes in them I/2" (aprox.12 mm) apart. He had brass wheels cast in a local work shop that made furniture fittings. From this simple start an iconic toy was born. Hornby's system of model building was like no other, most construction toys at that time were based around building blocks few had metal parts or methods of securely joining parts together. By 1901 Hornby's system was developed enough to have a patent granted. Hornby was given financial support by his employer D.H. Eliott to set up production. Late 1901 or early 1902 sets of parts were produced commercially and sold under the name of �Mechanics Made easy.� These sets came in an attractive tin box, the set comprised of just seventeen different parts (strips, brackets, axles, wheels, nuts and bolts) these parts were quite crude compared to what was to follow. At this time the strips were made of tin plate with folded edges, this gave the strips greater strength and avoided cut fingers! A model from those early days is shown on the right. The only tools required to assemble the models were a screw driver and spanner. The lid of that first set is shown above at 7/6 (35p) it was a very expensive toy.This represented more than a third of an average labourers weekly wage at that time. In 1908 the name was changed to the now famous name of Meccano.It is believed the name was chosen by Frank Hornby because it could be easily pronounced in all languages. The sets at this time still had a fairly limited range of parts but the owner could build working cranes, bridges, trucks such as illustrated above and dozens of other models. Around 1911- 1912 the range of parts started to expand rapidly allowing ever more complex models to be constructed, such as a giant Big Wheel and the Firth of Forth railway bridge. Shown on the left is the colourful lithographed, label from a 1911 Number 4 set. 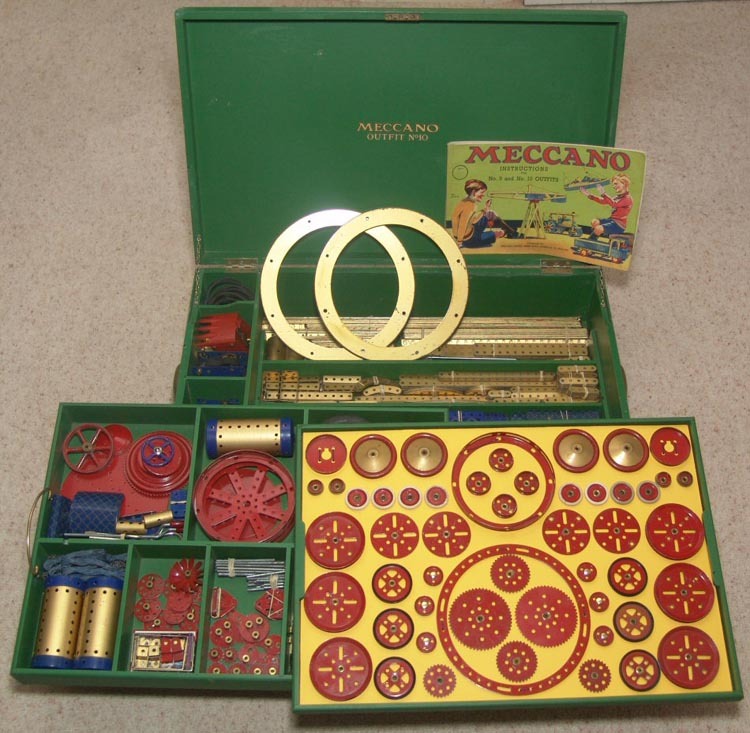 From almost the earliest days the proud owner of a Meccano construction set could purchase an accessory set to make their set up to the next in the range i.e. 2A would convert set 2 into set 3 and so on. To encourage this manual showed, models that could be built with the next set up. The earlier manuals had all the models from the sets in the range, these were shown with lists of the extra parts required as the sets progressed. This was another encouragement to develop your set and purchase additional parts. A list of all the parts in each outfit was printed in the back pages of instruction manuals, using this the owner could then build up to the next set as pocket money allowed and that's just what I did in the nineteen fifties! 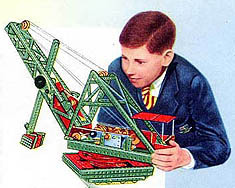 In the inter-war years1919-1939 the Meccano Company, under the direction of its founder Frank Hornby manufactured some of the finest quality mass produced metal toys ever made in the U.K. In 1914 a huge new factory was built at Binns Road , Liverpool to meet the ever increasing demand for Meccano construction sets. The range of toys expanded after 1920 with the introduction of Hornby trains and later came to include: Aeroplane Constructor (a model of mine is shown on the right); Motor Car Constructor; Dinky Toys; Dinky Builder a metal construction toy aimed at younger boys and girls and in 1938 Hornby Dublo 00 gauge model railways. 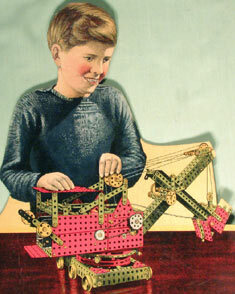 Other toys manufactured by the Meccano company in the inter-war years included: Kemex sets (chemistry sets); Elektron (electrical) sets; crystal radio receiver kits (somewhat of a failure); Meccano X series a smaller and cheaper construction toy to compete with "Trix"; Hornby clockwork boats; Dolly Varton leather board doll's house and metal doll's house furniture. 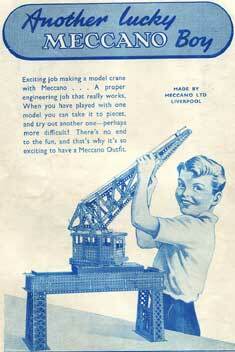 Girls and girl's toys rarely featured in the Meccano Company's publications or products. It was I think, perceived that by associating their products with girls, their key market of boys would be harmed! 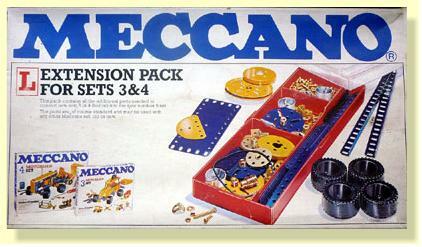 In 1977 set box lids were introduced showing girls and boys in an attempt to attract girls to Meccano but it meet with little success and in 1978 a new range of sets was introduced. Meccano, Hornby trains and Dinky Toys were also produced at a large factory in France, and for a short time there was a factory producing Meccano and Hornby trains in New Jersey, U.S.A. Prior to the first world war Meccano had set up a joint Company with the Märklin brothers in Germany to produce Meccano but when hostilities started the enterprise was handed over entirely to Märklin by the German government. Märklin continued to produce their version of Meccano until a few years ago. In the 1960s Märklin once again supplied motors to the Meccano Company and were sold under the Meccano name. This was making a circle going back to 1911 when Frank Hornby had a contract with the German company produce the first Meccano clockwork motors. 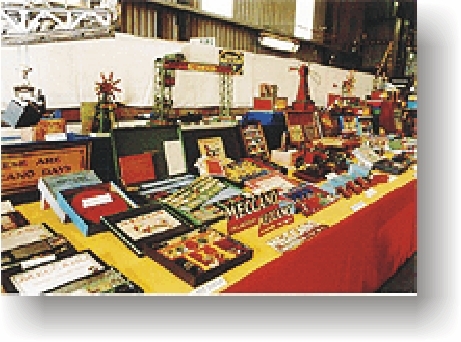 To encourage boys and promote Meccano products the Meccano Guild and The Hornby Railway Company were set up by Frank Hornby and ran by the publicity department. Members numbered many thousands throughout the world, they were encouraged to set up their own clubs locally where regular meeting were held. members not only built Meccano models and ran Hornby railway layouts but had football (soccer) and cricket teams, went on outings and did other boy's activities. 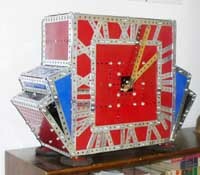 Club events and meetings were reported every month in the Meccano Magazine. These years saw the greatest success for the company with many new products and an ever increasing range of Meccano parts. Boys could even purchase a jersey or pullover of a design that had been featured in advertising illustrations these were made for Meccano by "Pringle" a well know quality brand. 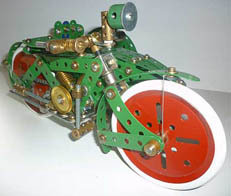 From 1914 until 1926 the parts were nickel-plated, in 1927 for the first time Meccano was finished in enamelled colours, red and green although many of the parts at first remained nickel-plated. By now the system was quite advanced and boys could build superb complex models such as the twin cylinder steam engine shown above, from the Super Model series of instruction leaflets the plans for this engine were first published 1929.This year also saw the introduction of an attractive vertical boiler, steam engine that could be incorporated into models,sadly in the years following it was hardly promoted and by 1936 had disappeared from sales catalogues. In the November 1934 Meccano Magazine, a completely new range of sets was announced with alphabetical set names A -L the L set was to be the largest set produced by the company. These new sets had flexible plates making it possible to build more realistic models, until then models tended to have a rather skeletal appearance. 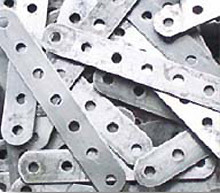 It has often been suggested in the Meccano Magazine that plates of this type could be made from card or sheet metal. Indeed the first flexible plates were made from fibre board but within a short time, less than a year, they were changed to metal. These sets also had bold new colours, gold for strips and girders, plates were blue printed with yellow cross hatching, red for circular parts and wheels. This colour combination did not look very good on some models especially the new tin plate road wheels, these had a gold centre and red tyres, later changed to red centres and cream tyres. 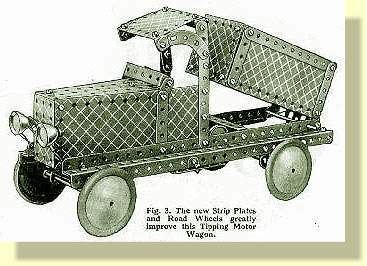 The picture below of the "Tipping Motor Wagon" from set D is from a 1934 Meccano magazine illustrating the use of the new parts. 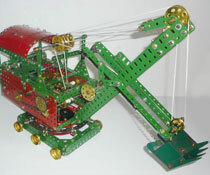 It was pointed out in the Meccano Magazine that sets and parts could still be purchased in red and green. However sets exported to countries such as Australia and Canada did not have the parts finished in gold but in green with the flanged plates and flat perforated plates finished in red these colours being almost the same as the later post war colours. The flexible plates were still cross hatched yellow on blue as those sold in the UK. A complicated series of conversion sets was also made to update sets by adding the new flexible plates.The larger sets "K and L" were very expensive and in a time of economic depression were far beyond the dreams of the average Meccano boy, these sets were for only a privileged few. The "L" set was to be the largest set ever produced. In 1937 the range of sets was changed this time to a more sensible and understandable numerical system 0-10. Realism had set in, the new sets had a lot less parts than their equivalent sets in the previous A - L. range. 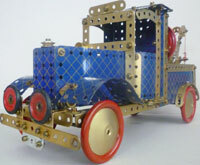 Interestingly Meccano in France continued with blue and gold gold colours until 1970. The new sets for 1937 heralded the introduction of the iconic Number 10 set, every Meccano boy's dream. Shown below is a near perfect No. 10 set from the year 1938, the set is displayed just as it was shown in the 1938 catalogue, the presentation certainly has the Wow! factor (picture by kind permission of Charles Steadman). When the Number 10 set was re-introduced in mid 1950 it did not contain the electric and clockwork motors, flywheel or the digger bucket. However it still had the pre-war instruction manual a new set of instructions was not introduced until 1954 these lasted until the demise of the set in 1992 then being produced at the Calais factory in France. 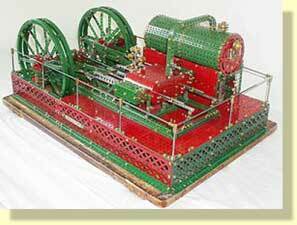 Frank Hornby the inventor of Meccano died on September 21 1936. 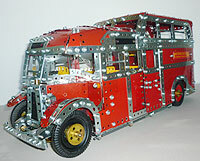 Sadly the Meccano company never recovered the drive that he brought to it. His son Roland took over as Managing Director but he never had the interest or dedication of his late father to the company or its products. The war years from 1939 - 1945 soon brought many cut backs and by 1941 only a small range of sets remained in production or for sale and in all probability by early 1942 all production for sale had ceased. Legislation was passed by the British government prohibiting the production or supply of all metal toys and parts from September 1943. Long before this deadline the Meccano company had totally gone over to production of items for the war effort. However the production of items for the war effort did include Meccano! In the Meccano Magazine editorial of March 1944 headed "Meccano on War Service" it was stated that in service training schools Meccano mechanisms for demonstration purposes have been in great demand, some produced with 24 hours notice. All details were to be reveled after the end of the war. So Meccano parts were being produced at Binns Road and the model room was apparently active, making mechanisms for the services and new models for the Meccano Magazine although these tended to be simplistic or useful items for the home. 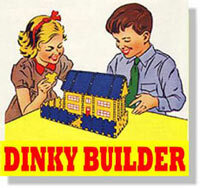 Production of Meccano and Dinky Toys resumed spasmodically in late 1945 not long after the end of the Second World War. The advertisement above is from April 1945 and gives hope of things to come. By December 1945 things were looking more hopeful as the advertisement on the left shows, from the back cover of the Meccano Magazine of December 1945. This was the first advertisement to announce supplies would be in the shops ready for Christmas but very few were. The colour of parts had changed from the pre war gold and blue to the familiar mid red and green. Although parts in these colours had been in some export sets in the 1930s and until production stopped around 1941-42. The products sold in the immediate post war were much the same as those produced prior to the war and perhaps a few were possibly unsold pre-1943 stock. The box lid above right was the same design as that of some six years earlier but with the new colours. The range of products were smaller and in very limited supply especially for the home market, most were exported. 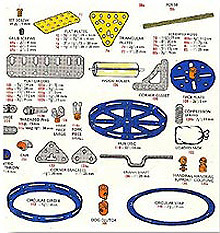 The range of Meccano parts was reduced too from those of the pre-war days, many of the more specialist parts such as the geared roller bearing, digger bucket, and train parts were dropped. It is probable that some of the tooling for these parts was sent for scrap during the war.The aero constructor and car constructor sets were not to be re-introduced either. It was not until 1947/48 that a fuller range of Dinky Toys, Hornby trains, Dinky builder and Hornby Dublo were made available but again in very limited quantities. Hornby "0" gauge electric train sets were also produced but for export markets only. 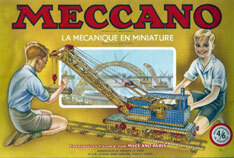 The advertisement above right, featuring the blue/gold traction engine is from the April 1947 Meccano magazine. Meccano Magazine advertisements of this time often mention was the shortage of products and reminders to take good care of your Meccano products. As late as 1949 shortages were still being mentioned in advertisements. Those with deeper pockets had to wait until mid 1950 to see the re-introduction of the Number 10 Outfit, although it had been listed in 1949. In 1948/1949 revised instructions manuals sets 0 - 9 were published with some of the older style models replaced or revised. these manuals had the iconic Block setter crane, father and boys illustration. Then another blow, not long after production started gearing up again with many new products planned the Korean War (1950-1953) and rearmament once again brought severe shortages of materials. This meant production and quality had to be cut back, many former brass parts were made in steel with an anodised black finish these included, angle brackets, pulleys, washers, nuts and bolts. Things started improving in October 1953 when it was announced on the "Spanner" page of the Meccano magazine, that several parts not available since 1940 were to be re-introduced although they were not exactly useful parts to the majority of Meccano model builders but it was a start. See illustration below. 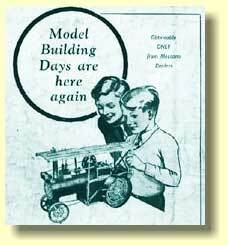 In 1954 new parts and completely new instruction manuals were announced, until then many of the models were based on those originally published in 1937 these had a rather antiquated appearance for boys born after the war. 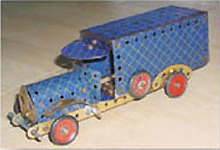 The model of a Foden truck shown above is from the 1954 7/8 manual. Shown below is a page from the 1954 Meccano catalogue, announced as the "Toy of Century" there is certainly a tone of optimism in the brochure. Its probable that many of these new parts and manuals would have introduced earlier had it not been for the Korean war. 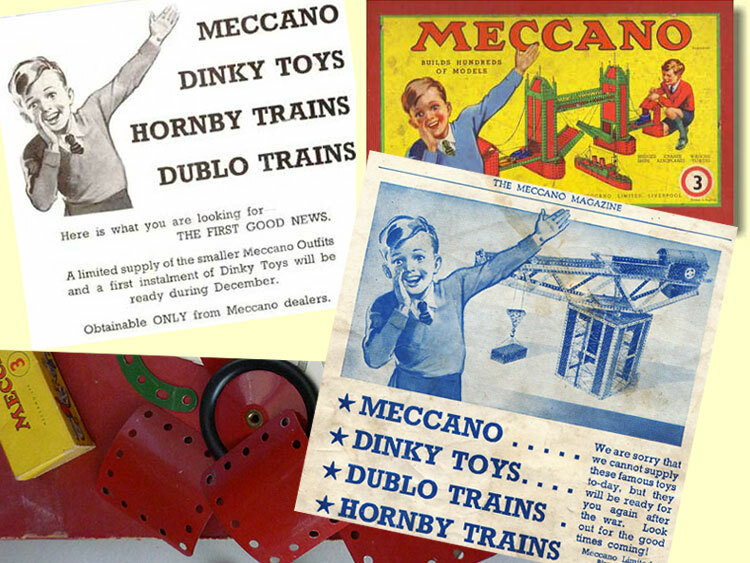 The mid 1950s saw great success and profits for the Meccano Company with Meccano sets, Dinky Toys and Hornby Dublo model trains all selling very well. At school I remember most boys wanted their toys and they were certainly the "Toys of Quality" mentioned in advertising. However products from the Binns Road factory were never cheap and cheaper rivals were taking an ever increasing share of the toy market. The supremacy of Dinky Toys the company's biggest selling product was under threat from cheaper Corgi Toys these had windows unlike Dinky Toys, Lesney Matchbox Toys and Triang model trains. 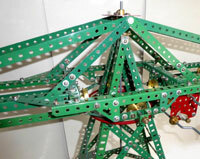 As the fifties drew to and end Meccano parts were changed to a much lighter shade of green and red. The colour change was partly to distinguish the new lead free paint from the older paint with lead content. The set and parts boxes were marked with a round yellow sticker bearing the letters LF. 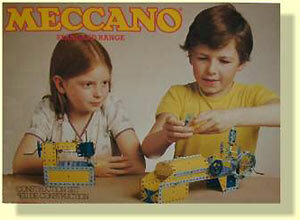 The nineteen sixties brought many changes for the Meccano Company including serious financial problems. In 1962 there was new packaging for Meccano sets and completely new manuals using exploded diagrams, instead of photographs and lengthy text. The sets however were changed very little in their parts content although several new parts were introduced at this time including narrow strips and plastic flexible plates. Narrow strips had been first shown in a 1920's manual see 1929 Level Luffing Crane but were not put into production for nearly 40 years! In the August 1964 Meccano Magazine there was a dramatic change in the colours announced, these became black, yellow and aluminium this followed the take over of the Meccano company by Lines Bros. the makers of Triang Toys. 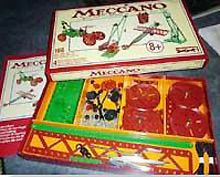 Advertised as the "New Look Meccano", the 1- 10 sets were now themed with names such as "Site Engineering" and "Breakdown Crew set" although the set numbers were also retained. The illustration on the right it from a publicity brochure advertising the new sets and colours. The conversion sets continued to be available although the 9a was dropped in 1966. The aluminium finish was not at all durable and in 1967 the parts in this finish were instead zinc plated, parts in these colours continued until 1970. The contents of the sets remained much the same as they had been in the previous post war ranges although the packaging and instruction manuals changed several times.Many of the models involved tight bending of the new plastic plates but they were just not robust enough to straighten out or bend in another way. In an interesting throw back to the past Mecano, introduced a steam engine in 1965 produced for them by Malins makers of Mamod steam engines. 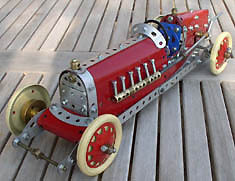 There had been Meccano steam engines in the past notably the 1929 engine with a vertical boiler, the Mamod made engine was similar but with a horizontal boiler. In 1965 a new Mecano motor the "Powerdrive" was introduced, the motor had a six speed gear box and was originally sold and advertised in the MM as the Monoperm "Richard I" these motors were made in Germany. Meccano also continued the production of the E15R and two clockwork motors the linage dated back to the nineteen thirties. This post war period cannot be left without one of the most enduring images ever produced by Meccano and recognisable to any "Meccano Boy" brought up in the 1950s. The illustration is of a block setting crane by W.H.Pinyon an illustrator who's work was commissioned by the Meccano company for their cover designs and advertising over many years. The crane in the illustration was used on manuals from 1948 - 1955. 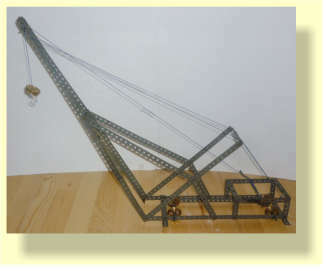 Although similar in many ways to the "Super Model plan", the Giant Bock-setting Crane, produced in the inter-war years has different proportions, the rear boom of the crane for one thing is shorter. This may well be artistic licence enabling the composition to be correct. W.H. Pinyon sometimes took things a bit too far though, a 1950's Hornby Dublo advertisement shows pipe smoking Dad with five fingers in addition to his thumb! 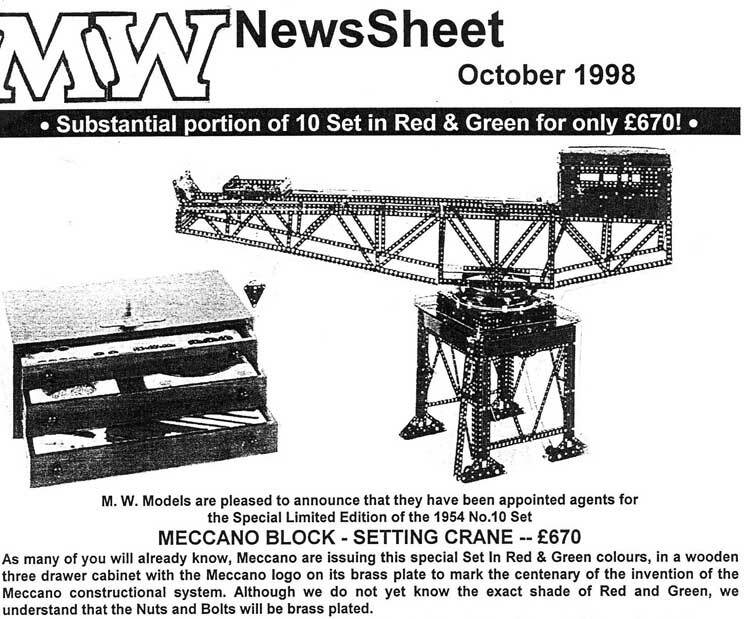 No instructions were ever published for the block setting crane as illustrated by Meccano Ltd. however MW Mail Order have published a Model Plan 143 by Bill Steele based on Pinyon's iconic illustration giving the history and full building instructions. The model by the way could not be built with the parts in the number ten set! Another well know W.H.Pinyon illustration featuring the 1954 number 10 set mechanical loader is shown on the right. 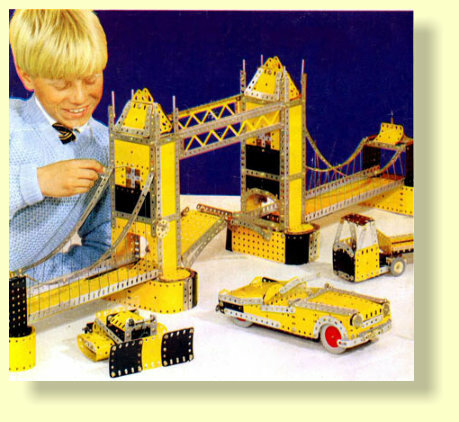 The Illustration shown left of the boy with the large sets is taken from an early 1970s promotional leaflet and shows the No.9 and No.10 sets the largest available at that time. Described in the leaflet as, " 9 and 10 the big sets for the boy who has everything! " Although in reality these sets were aimed more at the growing adult hobby market. 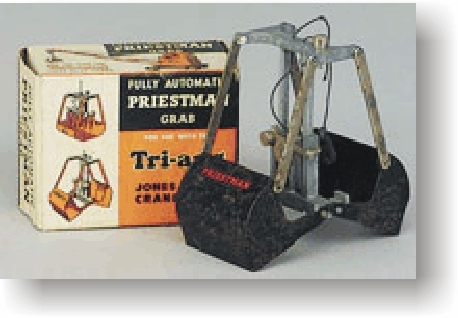 Although Triang had taken over Meccano in 1964 the name of the company had remained as Mecano Ltd. but in 1970 it became Meccano Triang Ltd. In the same year the colours were again changed this time to blue, yellow and zinc. A new range of sets were introduced the large number 9 set was discontinued and all the sets in the range moved up "0" becoming "1" and therefore "8" became "9" each set had a few changes of parts, the number ten outfit remained in production, largely unchanged. In France the colours were changed from blue and gold to the same colours as those from Liverpool. In 1971 there was another change in ownership of Meccano in the UK when it became part of Airfix, makers of Britain's most well known plastic kits and house hold goods. 1973 saw the introduction of Meccano Highway and Army Multikits, these were sets with standard parts finished in special colours. The sets came with a ready made metal cab in two parts, wide plastic wheels and colourful stickers, enabling a wide range of service vehicles to be built. 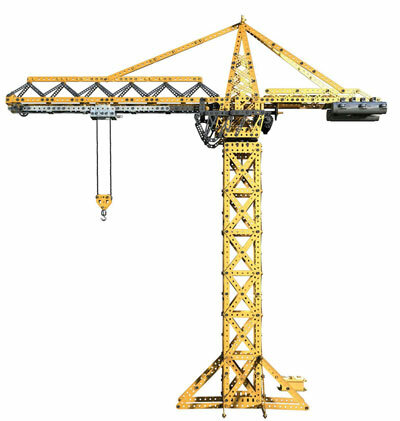 An attractive crane set with all yellow parts was also introduced around this time with a new small 6-12 volt motor included in the set. Interestingly these sets were produced in a deeper shade of yellow than the colour in the standard range of sets. In many areas though quality was reduced with more plastic plates in the sets, many former brass parts were now plated alloy or steel.The sets and parts suffered too from very poor quality control and there were many returns of stock because of the poor zinc plating which left parts with a white powdery coating. In 1977 new packaging was introduced shown on the left, in keeping with the times it was unisex with pictures of both boys and girls of different age groups going up though the set range. Pity she has a sewing machine he has a steam engine. However policy changes at Binns Road meant the sets were very short lived. A major change came in 1978 when the old set range, 0 - 10 that went all the way back to the 1930's, was abandoned. In its place a series of five sets 1- 5 were introduced in new dark blue and deep yellow colours. The enamelled finish on these parts was far superior to the previous zinc plate. Two extension sets were also available "S" and "L" . In a rather belated break with tradition the sets had a range of parts totally unrelated to those in all previous series of sets. Many of the parts included had only ever been available in the much larger sets one notable omission from all the new sets was part 52 the 5x11 hole base plate that had featured in every set from the earliest days. One welcome addition were wider "Road Wheels" with a stylish mag alloy look but they used nine separate parts. 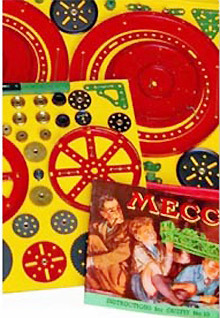 It had taken Meccano a long time to recognise that the tin wheels and the later but similar plastic wheels in the sets looked more like those found on vehicles from the 1920's. In 1979 another new construction set was introduced "Space 2501" the parts were mainly white.The Meccano L extension set right is from the 1978 range. I bought this several years after the closure of the Binns Road factory, it was hidden on the bottom shelf of a toy shop in Cornwall, the owner sadly did not even know it was there. I have always liked this colour scheme but it never had a chance to become popular. The stock car below was featured on the box lid of the number 3 set and shows the effective use of the new multi part wheels. The number 9 ( before 1970 the number 8) and 10 sets were still available in wooden cabinets but now in the new colours with more or less the same range of parts as the previous colours. The 10 set was however in an inferior three drawer cabinet with vacuum moulded dividers and cost around £350. Not many of these sets were sold as a result there are very few around today on the second hand market. 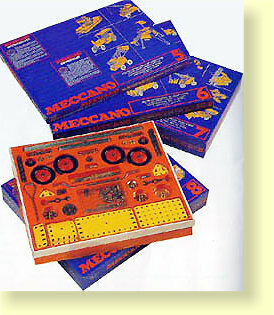 The 1978 range of sets were a belated attempt to bring Meccano up to date with a contemporary presentation, strong graphics were used on the packaging and new modern looking models, some old favourites were included though such as the Meccanograph. Unfortunately by then the writing was on the wall, several years of falling sales, the changing tastes of what children wanted and competition from other construction toys was all bad news. The Meccano company suffered too from out of date production methods, bad management, lack of investment, poor labour relations and restrictive union practices, these all conspired to bring to an end production at the world famous Binns Road factory. At 3:30 on Friday, 30 November, 1979, the 800 workers were told by Airfix industries, that the factory would close in 40 minutes. Following the closure of the factory in 1979, questions were even asked in Parliament. It also made newspaper headlines, with such classics as "Meccano Company wound up." 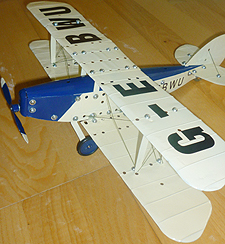 After the closure of Binns Road the Airfix Industries briefly out sourced the production of parts and a small range of sets named 1000, 2000 and 3000 were produced. 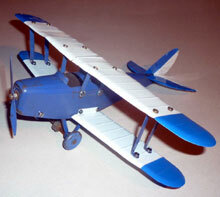 However in early 1981 the Airfix group its self became insolvent and it was all over. The result was that it became very difficult to get hold of any new Meccano parts or sets. The situation was not helped by the very small amount of stores still bothering to stock spare parts. 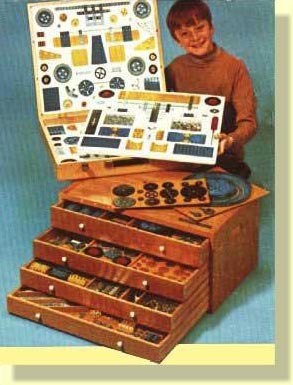 In the nineteen fifties every major town or city would have had at least one Meccano dealer with a cabinet full of tempting spare parts.1981 really looked as though it was the end of Meccano and what was seen as a British institution. At the time I remember searching toy and model shops for sets and spare parts for my two sons plus of course a few for me. However all was not lost for the Meccano enthusiast, through the efforts of Geoff Wright of MW Models in Henley-on-Thames and other enthusiastic dealers, new and used parts were still obtainable, although often in short supply. 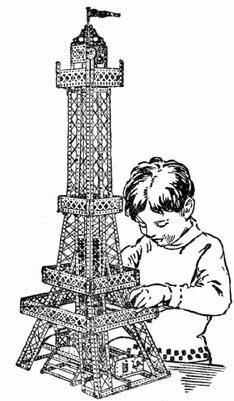 Many Meccano enthusiasts from around the world will remember fondly the regular mailings MW models sent out with news of new Meccano products from France and best of all the "Lots list" of second hand parts, sets and manuals. Geoff Wright owner of MW models had also bought the remaining stocks of parts from the receivers of Airfix and these were still being sold when he closed his shop in 2003. Things slowly improved, due to the fact that In 1912 Frank Hornby had set up a French subsidiary, at first importing and distributing but by 1921 some manufacturing too, in 1930 a large factory was set at up at Bobigny near Paris producing both Meccano and Hornby Trains and later Dinky Toys. Since 1959 French Meccano manufacturing has been centred in Calais. 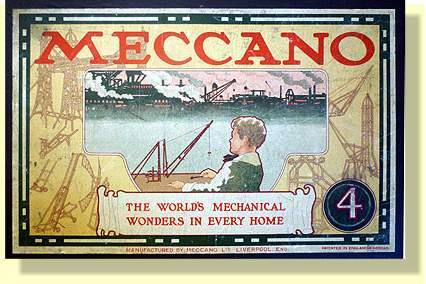 Fortunately for Meccano enthusiasts around the world the French company was unaffected by the ending of production in the UK as it was owned by the American food company General Mills and had not suffered the fate or the problems of the Liverpool factory. They continued manufacturing traditional Meccano sets and parts, but on a fairly limited scale. In 1985 the Calais factory was taken over by a French Meccano enthusiast and accountant Marc Rebibo. 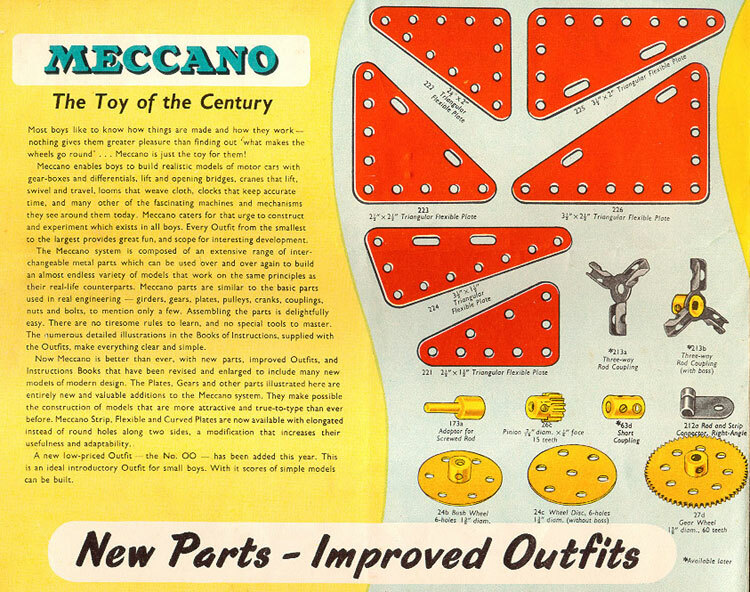 Under his ownership Meccano re-introduced the 1 - 10 set range and the 1A - 9A Accessory sets, as "Enthusiasts Sets" these sets had the same content, box designs and manuals that had been produced at Binns Road in the mid 1970's and were welcomed by enthusiasts. Including me as I progressively bought the sets building our son's set to a number nine. These sets are shown above right taken from the 1990 catalogue. That year also saw saw the introduction of allen headed bolts and the Number 10 set was presented in a new five drawer wooden cabinet. Sadly the "MW News Sheet" for November 1992 announced after 55 years the demise of the number 10 set and urged all those who might want a set to order one, the price then was a staggering £1,158.55. 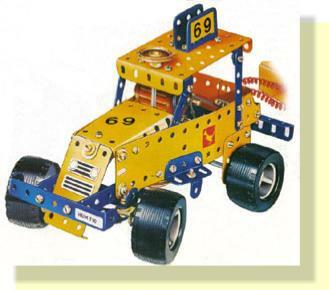 In 1998 Meccano France announced the production of a Centennial set (a bit early) this is shown on the right taken from an MW NewsSheet. Although beautifully presented in a wooden chest it turned out to be a big disappointment to Meccano fans as it was felt that 1954 number 10 set block setting crane was a not a good model. 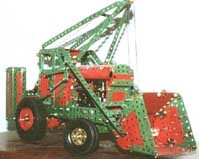 It was not even finished in the red and green colours of the 1954 crane the colours were deep burgundy and very dark green, similar to the nineteen twenties colours. However it was a block setting crane but far from the famous one. The set was only made in one batch and as is no longer available. In the years since the closure of the Binns Road factory in 1979 many new metal and plastic parts have been introduced by Meccano. 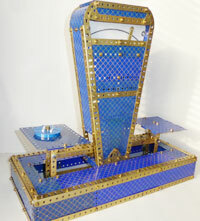 There is also an ever growing range of replica parts plus many other parts that were never made by Meccano. Reproductions of parts discontinued many years ago are once again available such as the geared roller bearing. All the new parts remain compatible with the very earliest sets and all still use the same half inch hole spacing and 5/32" BSW threads. A recent major change has been the introduction of many new parts with a 1/4" hole spacing. The most frequent question I get asked when I exhibit models is "Can you still buy metal Meccano?" Well the short answer is yes, production of metal Meccano continues today in Calais, France and other countries. Since August 2013 Meccano has been owned Canadian toy company Spin Master. Things have now changed a lot though, many of the parts are now plastic, in fact some sets are hardly recognisable as Meccano at all but do still fit together in the traditional way with nuts and bolts. The new sets are nearly all themed to build a single model or a range of five models from the instructions supplied. The model on the right a tower crane set was introduced in 2015 with remotely controlled functions. 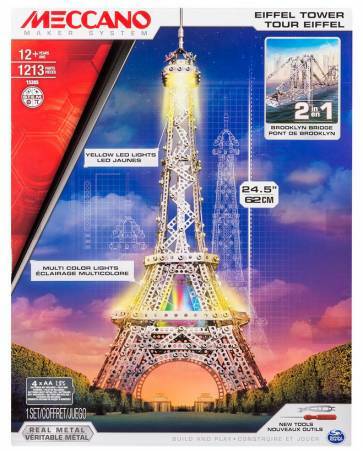 Below is another recent set "The Eiffel Tower" These modern sets for me the appeal once held for past generations of children alas these sets are possibly the end of of a long tradition of all metal Meccano although they are still available. From comments I get when I display Meccano many children and parents would like to be able to still purchase older style sets such as the 1985 "Enthusiasts Series" but in the modern world of intense competition in the toy market they would just not be viable. All old parts can of course be added to the modern sets and visa versa as the hole spacing and bolt threads has remained the same as over 100 years ago. The new sets from 2016 - 2018 although attractive have many more plastic parts and are more of a plastic kit that bolts together but one that can be taken apart. A great disappointment to life long fans of the system such as myself, still times change but not for me ! 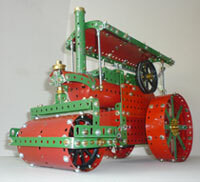 Please however do visit the Meccano web site to see what Meccano has to offer today you might be surprised! The continued of production of Meccano in France ensured that Frank Hornby's original invention first patented in 1901 is now well in to its second century and the name "Meccano" is today still one of the most well known toy brands in the world. The system has been copied by hundreds of imitators but rarely bettered and none have survived as long as Meccano. The owners of Meccano "SpinMaster" are committed to the continued production of Meccano worldwide and have many exciting projects planned for the future. Meccano sets can be bought at stores throughout the world unfortunately only a few specialist dealers sell separate parts. In the U.K.many department stores, Argos and Amazon on line sell Meccano kits. See the link "Where to buy Meccano" for a list of some of the places you can buy Meccano sets and extra parts both new and second hand. 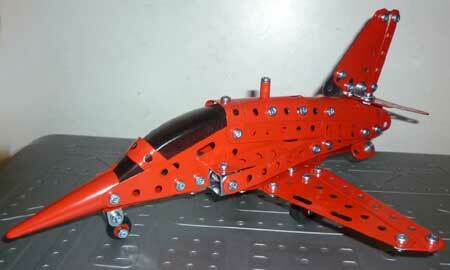 I built the model of the Hawk Jet shown below in January 2011 from a "Special Edition Set". 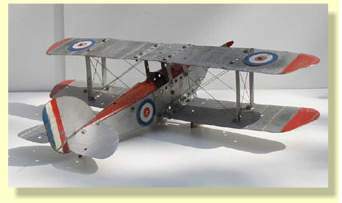 I think it is a rather attractive model although unfortunately other aircraft cannot easily be built with the set, unlike the Meccano Aeroplane Constructor kits of the nineteen thirties. 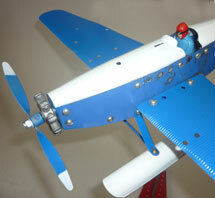 It does show however what a realistic model can be built with relatively few Meccano parts. Although the Hawk jet sets are no longer made they can often be seen for sale on eBay. As mentioned in an earlier paragraph the Meccano system only needs two tools a spanner and a screwdriver although in reality two spanners "D" are required to able to lock nuts on bearings. These spanners were supplied along with a basic screwdriver "C" in all sets from 00 - the 10. However when you purchased or worked up to the No. 6 set you had another tool, the drift "F" This is a very useful tool for aligning parts but was dropped from the range in 1978. When you reached the exulted heights of the Number 9 or 10 set included were two extra tools, a box spanner "E" (useful for holding a nut under bolts) and a handsome wooden handled screw driver "A". 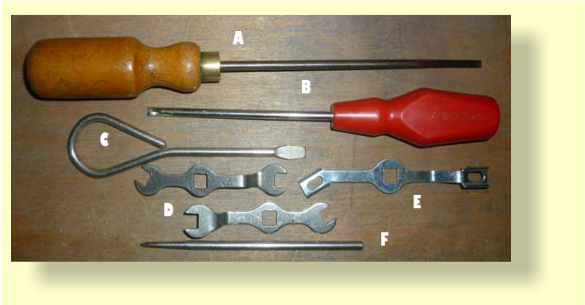 All these tools were of course available separately from Meccano dealers.The screw driver "B" appeared in sets in 1973 and went through various versions until the end of production at Binns Road. The wooden handled screw driver is a nice tool but the other screwdrivers are pretty poor. I use good quality engineering screwdrivers the type available from a good tool store. Its best to have several lengths and a smaller headed one for set and grub screws. Modern sets have a spanner and a hex wrench , again the latter is not up to a lot and a suitable hex headed screw driver is much better for general use. Other useful tools are; surgical foreceps, for getting and holding nuts and bolts in difficult places, good quality long nose pliers and a telescopic pocket magnet.